Polygamy has declined in the last decade but remains common in West Africa. For example, 33% of women in Nigeria reported that their husbands have more than one wife (Demographic and Health Survey, 2013). This very old practice is essentially recognised under customary law and/or religious practices. In most West African countries, polygamy is also recognised and regulated by the civil law that allows a man to marry up to four women under certain conditions, including the financial capacity to support multiple wives and families. In practice, a polygamous union is in most cases limited to two women per couple. 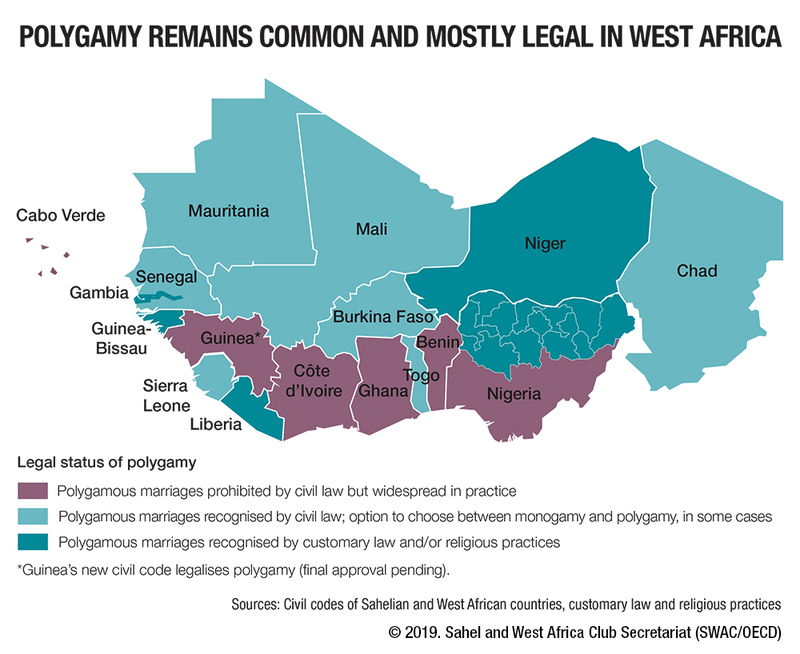 Six West African countries have civil codes that formally prohibit polygamy (Benin, Cabo Verde, Côte d’Ivoire, Ghana, Guinea and Nigeria) but legal restrictions are rarely enforced. Other countries such as Burkina Faso or Togo recognise polygamous unions under modern civil law, but allow couples or men (Chad, Mali and Senegal) to choose between a monogamous or polygamous union. In some countries such as Mauritania, a man is only allowed to marry a new woman with the consent of his existing spouse/s. In Nigeria, multiple marital regimes operate in parallel. While civil law formally prohibits polygamy, the 12 northern states that are governed under Islamic Sharia law recognise polygamous marriages. If the vote on the new civil code is confirmed, Guinea will become the latest African country to legalise polygamy (following Kenya in 2014). The legal status of a married woman can help protect her and allow her access to certain rights. However, polygynous marriage contravenes a woman’s right to equality with men. Traditionally more prevalent in rural areas, polygamy has also adapted to the urban and educated environment.